"She gets so stupid around men." Volume 2 in the Wild ARMS saga finds our enterprising thieves caught in a number of strange situations, all of which seem somehow directly or indirectly related to romance. While the central mission for Arronax and Sheyenne is still locating Sheyenne's lost body, their explorations into the unknown start to get pretty weird this time around. Everything is set into motion when they decide to take a train further into the desert, only to discover that the train contains not only some suspicious characters, but a feuding couple, a pregnant woman about to give birth, and a paranoid conductor whose sole mission in life is to make the train run on time. As usual, Mirabelle and Loretta are along for the ride as well, attempting to seduce treasure away from mysterious, handsome, and wealthy men. They also keep up to date on all the latest treasure gossip, hoping to achieve that one big score. Oddly enough, though the characters are all at odds with each other, to a certain extent, it is only together that they realize what a great team they make. Temporarily, of course. Love as a means of either finding hope or corruption is the central theme of Western Romance, and as usual for this series so far, nothing is very serious and the plot is very far from being linear. The episodes can practically be watched out of order. This is isn't a bad thing, though; it allows a great deal of writing freedom and creativity. While some viewers might be potentially turned off by the lightheartedness here, these random adventures in the desert are actually a lot of fun. While typical anime series often have a strong, cohesive central plot, the off and on nature of Wild ARMS is relaxing and a nice break from that usual flow. There is a risk of repetition, though. While I've enjoyed the show up to this point, the writers potentially risk ruining the series by simply doing the same thing over and over again and, hopefully, in Volume 3, there will be some variety besides the usual Mirabelle-seduces-victim/Sheyenne-hears-a-treasure-rumor thing. 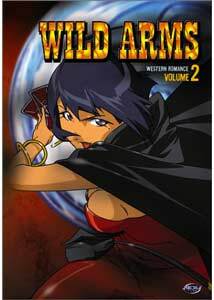 Still, it's been a while since I've laughed out loud at an anime series, and Wild ARMS is pretty darn funny at times. I also love the sudden silly cliffhanger endings to the episodes that often go completely unresolved (for example, in the very first episode, the gang is trapped on a floating island that can only be left once every year...how'd they get off?). I think there's an immense audience for this show, potentially one that isn't even into anime, and I'd love to see it hit television. It would make a nice change of pace from the super-kiddie anime (Pokemon, Kirby) or the serious and deep anime (Reign, .hack). Despite inspiration from a series of video games, Volume 2 has long since abandoned any pretense of being somehow connected to the games, which might disappoint some. Fun is the prime motivator here, however, and it succeeds. Image Transfer Review: A perfect, colorful, brilliant image resides on the disc, with all the usual super-quality issues from ADV. Perhaps most impressive is the rock-solid black level which maintains all of the details in the artistry perfectly, especially in darker scenes. There are no negative issues to report here. Audio Transfer Review: The stereo surround offers a nice, expansive way of enjoying the series without getting particularly active or wild. There are few surround effects, and everything is mainly centralized in the front, which is not a bad thing. Whenever action kicks in, though, there's plenty of impressive mixing to keep things interesting and at the right level. Extras Review: The extras are basically in the same vein of most ADV series releases, with conceptual art, one-sheet, and trailers. Now, however, there are some interviews with some of the Japanese voice cast that are pretty interesting, as well as an original Japanese promo for the show, which offers a look into the marketing there. While there is no textless opening and closing animation, that will likely come on the next volume and is on the previous volume as well. While not delving into the totally surreal or weird, Wild ARMS is still an odd duck. It's a totally wacky, yet surprisingly entertaining series so far where the main characters are likable because they're so unlikable, as odd as that sounds. It's just misadventures and silliness, but it all works to a surprising degree.